If you’re born anywhere in the Eastern mediterranean you’d be familiar with tahini, a liquid butter made from pressed sesame seeds. Tahini has a pleasantly bitter and nutty taste and is used regularly in food preparations across the Levant. Most people in the West will buy it to make a one-time gratifying home-made hummus, and will then relinquish the jar to the back row of the last shelf. Over time the liquid separates and the taste turns to rancid because they did not know how to use it, yet there are so many ways to incorporate tahini. Tahini based sauces are easy to prepare and make excellent complements to fish and roasted vegetables. Mix tahini with lemon juice, water and salt to get simple ‘tarator’; add a touch of chopped parsley to give it body and for more complex taste combine it with herbs and spices. 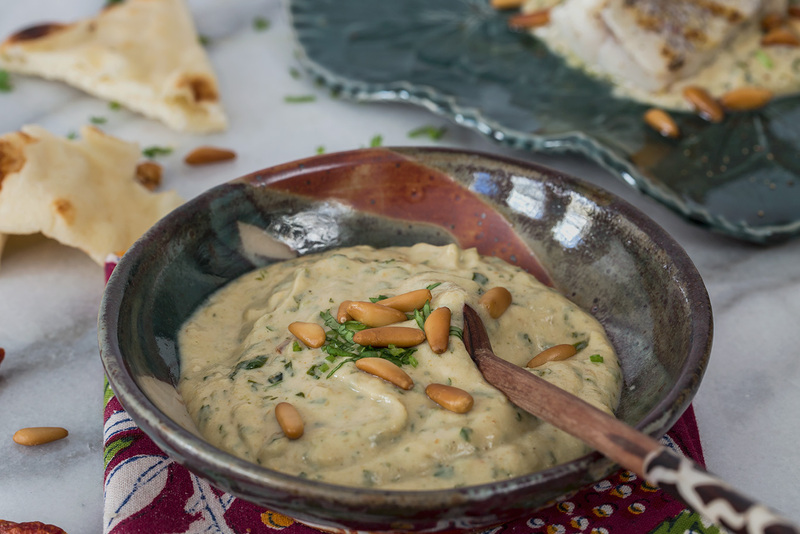 Spicy tahini sauce is delicious with grilled and roasted fish, it is also great drizzled over raw or cooked cauliflower florets. Make the blend thicker and you can then dip vegetables, and grilled breads in it. The choice is yours. Crush garlic to a paste. Heat olive oil in a heavy based pan and fry the garlic, chilli and ground coriander for 1 minute. Stir the fresh coriander into the mixture and cook it over medium to low heat for 2 to 3 minutes. In a bowl, mix lemon, tahini and salt. Tahini is made from crushed sesame seeds, so in effect it is a form of butter. When you add juice to it, it will act clump up and becomes thick. You need to add a little water to thin it down. It is up to you to decide wether you’d like the sauce to be runny like single cream or thicker to use as dip. Once you’ve reached the desired consistency, pour over the garlic and coriander blend and stir to mix. Finally incorporate the fresh coriander.